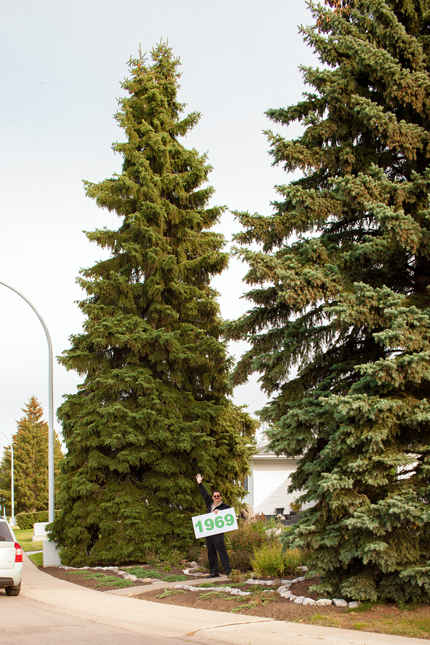 In late 1968 our neighbourhood was brand new – streets lined with new houses and new trees – many of them grade one trees from the young families on our street. My parents planted both my tree and my brother’s tree. But as if that wasn’t enough, we moved away for a year and rented our house to a young family who planted their child’s tree – and now over 40 years later – all of our tress are still standing. I’d bet that just about every house on that street (if not the whole neighbourhood) has had at least one "Grade 1" spruce tree somewhere in their yard. My parents still live in the home and have landscaped the yard so that the trees can remain in their places. We are proud of our trees and love they way they make our yard come to life.